Hyderabad: Delhi Capitals' skipper Shreyas Iyer in action during the 30th match of IPL 2019 between Sunrisers Hyderabad and Delhi Capitals at Rajiv Gandhi International Stadium in Hyderabad on April 14, 2019. 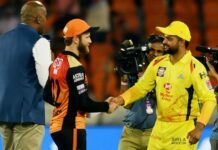 Hyderabad, Despite valiant efforts by Colin Munro (40 off 24) and Shreyas Iyer (45 off 40), Delhi Capitals could only score a modest 155/7 as host Sunrisers Hyderabad’s bowlers bowled decently on a good batting track. Asked to bat, Delhi’s innings started on a poor note — losing openers Prithvi Shaw (4) and Shikhar Dhawan (7) — with just 20 runs on board in 3.2 overs. Khaleel Ahmed accounted for wickets of both the Delhi openers. Munro, however, tried to anchor the Delhi innings and hammered most Hyderabad bowlers. But while trying to maintain a good run-rate, he lost his wicket to Abhishek Sharma in the eighth over. With Delhi on 69/3, skipper Shreyas Iyer and Rishabh Pant tried to stablise the ship, taking their side past the 100-run mark in 12 overs. 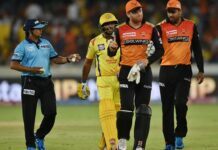 Bhuvneshwar Kumar cut short Shreyas’ stay as the Delhi skipper tried to ramp a short delivery over the Hyderabad keeper but failed in execution. A slight edge off him was easily caught by Johnny Bairstow. Just three ball later, Khaleel scalped his third, packing off Pant (23 off 19) in the 16th over. This left Delhi reeling at 127/5. 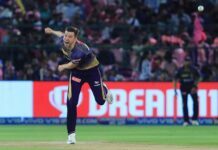 Delhi’s lower middle-order — Chris Morris (4 off 8), Keemo Paul (7 off 4), Axar Patel (unbeaten 14 off 11) and Kagiso Rabada (2 off 2) could only add 24 runs in the last three overs as Delhi failed to reach a big total. For Hyderabad, Khaleed was the pick of the bowlers with 3/30, while Bhuvneshwar bagged two wickets. Delhi Capitals: 155/7 (Shreyas Iyer (45, Colin Munro 40; Khaleel Ahmed 3/30) vs Sunrisers Hyderabad.